In 1953, before Gilbert started putting colored stripes on the 9xx streamlined cars, they made two varieties with no color stripe: chrome and satin silver. I have the whole chrome set and am working on getting the satin set. 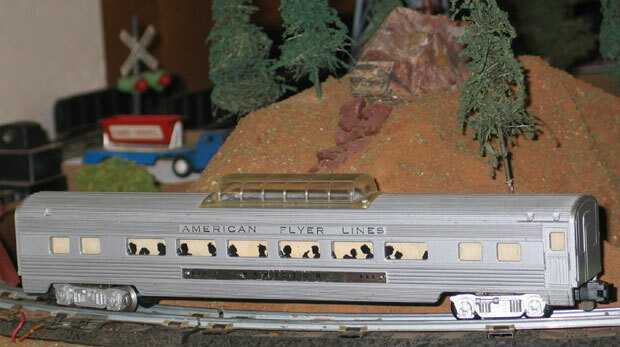 I've gotten the 960 Columbus combination car, 962 vista dome car, and 963 Washington observation car, but stilll need to get the hard-to-find 961 Jefferson coach. Neither the TM Guide nor Bob Tufts' "Almost Complete Guide" show a 961 Jefferson. Greenberg's Guide does show one, and there was a set of four cars sold on ebay in the fall of 2005 with a 961. The satin version of the cars were sold in three sets, none of which had a 961 coach. 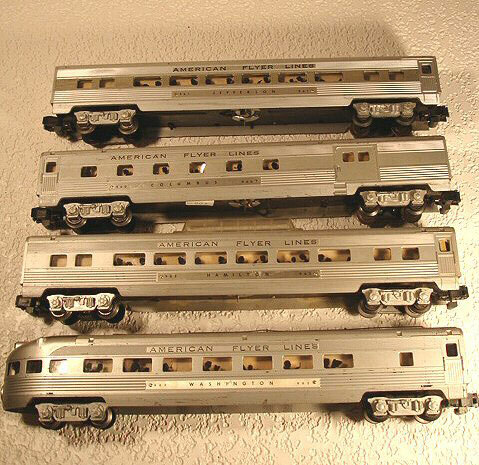 #K5334T Silver Comet Set made in 1953. It was also sold as #2H310. #K5357W Challenger Steam Passenger Set made in 1953. Satin finish #960 Columbus Combination Car made only in 1953. Satin finish #961 Jefferson Coach made only in 1953. It didn't appear in any sets. 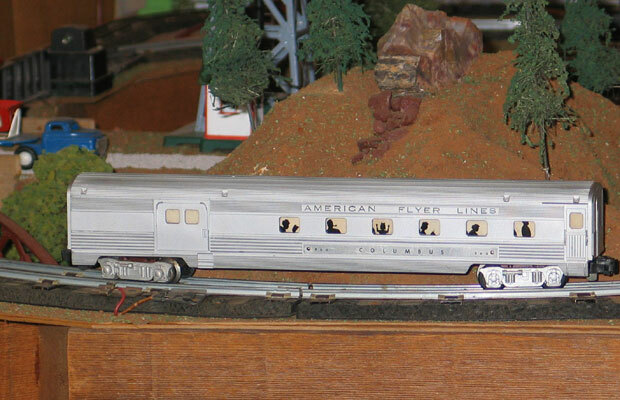 Satin finish #962 Hamilton Vista Dome Car made only in 1953. Satin finish #963 Washington Observation Car made only in 1953.